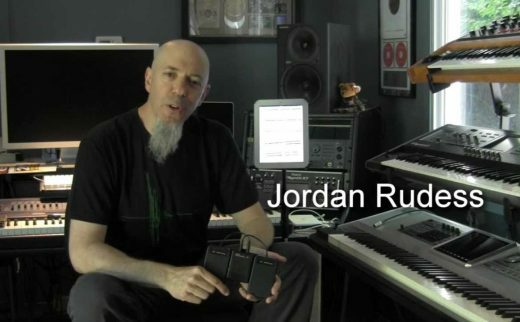 Legendary rock keyboardist Jordan Rudess, best known for his role in the progressive metal band Dream Theater, is endorsing the BT-105 Bluetooth hands free page turner for the iPad by AirTurn, Inc. The Juilliard-trained Rudess is renowned for his use of cutting edge technologies to craft and perform his music, having recorded 59 albums to date, and was recently voted by MusicRadar as "the best keyboardist of all time". "Being an iPad madman, I'm able to ditch paper binders and carry all my compositions with me on tour in a single super slim device with crazy good battery life," says Rudess. "I've found the AirTurn BT-105 to be an awesome companion to my iPad, enabling me to turn pages hands free like magic so I can keep my fingers on my tunes instead of swiping screens for page turns." The AirTurn BT-105 hands free page turner connects to the iPad wirelessly via Bluetooth and is controlled by two foot switches for forwards and backwards page turns in compatible apps. In addition to turning pages, the BT-105 can be used as a wireless controller for other applications, such as teleprompters, communication apps for people with disabilities, and for changing sound patches in two apps developed by Rudess himself, SampleWiz and MorphWiz.